On Thursday March 1, 2012, Siren Studios’ artist series platform; Rooftop Sessions will present Gregory Siff in There and Back: LA/NY. Having just come down from his first, and highly successful solo show with The Site Unscene, Gregory is back with a new body of work. In There and Back, Gregory reveals the private moments of his journey through the past two decades, exposing his range of emotions as well as those who had an impact on him along the way. Gregory’s unique technique and application of ink stains, spray, marker tags, knife etchings and poetry, visually express the maps of his reality; drawing from experience, conquest, loss and love. There and Back follows Gregory’s struggle of coping with the fracturing of a dream and the transformation to something greater once that fracture heals. Gregory has an innate ability to connect to all who he comes in contact with. Most recently collaborating with street legend and artist Risk from The 7th Letter. Gregory has been commissioned by The Standard Hotel and The De la Barracuda Wall; has exhibited in Los Angeles, New York, London, Dublin, Italy and Vancouver; and has appeared at MOCA director Jefferey Deitch’s Art Parade, in Andy Warhol’s Interview Magazine, Paper Mag, LA Canvas, Complex and Glamour. For There and Back, Gregory will also be collaborating on an installation with students from Communities in Schools, a non-profit organization that works within the public school system to determine student’s needs and establishes relationships with local businesses, social service agencies, health care providers, and parent and volunteer organizations to provide needed resources. Gregory is a dedicated supporter of planting success in children through the arts and will donate 10% of all proceeds from There and Back to Communities in Schools. Siren Studios is located at 6063 W. Sunset Blvd. in Hollywood, CA. 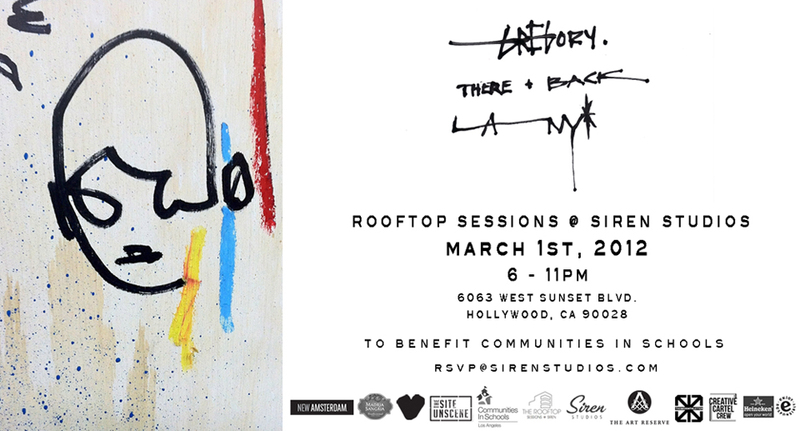 For Gregory Siff’s There and Back, Siren Studios’ Rooftop Session has teamed up with curatorial director Eli Consilvio of The Art Reserve as well as curators JB Jones and Wil Atkinson from The Site Unscene. Siren Studios created Rooftop Sessions, a periodic artist platform that extends their current contribution and support to the art scene in Los Angeles.